Khampagar Monastery is the main seat of the Khamtrul Rinpoche incarnation line in Kham, Eastern Tibet, and is considered one of the foremost monasteries of the Drukpa Kagyü lineage. 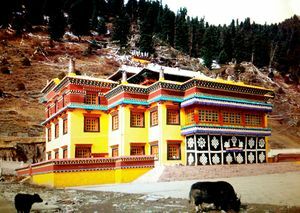 After its destruction in Tibet, the Eighth Khamtrul Rinpoche, Dongyü Nyima, rebuilt Khampagar Monastery in Tashi Jong, Himachal Pradesh, India, in the late 1960s. It is home to the famous tokdens, yogis who have gained high levels of realization.